Personalized rubber bracelets will help you to spread your message. Cerebral Palsy is a debilitating disease that affects 10,000 babies each year. Cerebral Palsy awareness wristbands help bring awareness to the condition and can help families cope with the disease. All wristbands from AmazingWristbands.com are made of 100% silicone, which makes them comfortable, latex-free, and non-allergenic silicone. Here, you can customize your Cerebral Palsy awareness bracelets with your personalized message using our easy-to-use online design tool. The recognized awareness color for Cerebral Palsy is green. 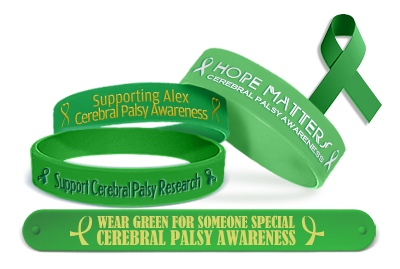 You can use your Cerebral Palsy wristbands to offer a general message of support, such as "Support Cerebral Palsy Research" or something specific, such as "Supporting Alex – Cerebral Palsy Awareness." According to the United Cerebral Palsy Foundation, Cerebral Palsy is broad term encompassing a number of disorders of the developing brain, affecting body movement, posture and muscle coordination. It is caused by damage to one or more specific areas of the brain, usually occurring during fetal development, before, during or shortly after birth, during infancy; or during early childhood. It is estimated that 764,000 children and adults in the U.S. manifest one or more of the symptoms of cerebral palsy. 10,000 babies born in the United States will develop cerebral palsy1. 1,200 - 1,500 preschool age children are also recognized to have cerebral palsy each year. At this time, there is no cure for the developmental brain damage that causes cerebral palsy. Training and therapy, however, can help improve muscle function and coordination. Why Buy Cerebral Palsy Awareness Wristbands from Amazing Wristbands? Amazing Wristbands is a leading provider of customized silicone wristbands available online, including Cerebral Palsy awareness wristbands. Our wristbands are comfortable, durable, and non-allergenic. Our professional and courteous customer service staff members will help you design your customized Cerebral Palsy awareness wristbands that will raise awareness and support. We offer a wide variety of wristband types and colors to help your Cerebral Palsy awareness wristbands stand out and make a bold statement. In addition to standard wristbands, AmazingWristbands.com also offers super popular slap bands that "snap" to a person's wrist, as well as thin half-inch bands, thicker one-inch bands, adjustable bands, USB bands, silicone rings and silicone key chains. 100% Silicone for your Cerebral Palsy awareness campaign. FREE Shipping for Cerebral Palsy wristbands in the U.S.
FREE artwork and design for your Cerebral Palsy wristbands. FREE Color Matching – choose green or one of our many other colors! Get a detailed wristbands quote for your Cerebral Palsy wristbands in minutes!